Star Wars Mandalorian Bookends are just the thing to end the hunt for where your lost DVD cases went! The designers have taken this iconic Boba Fett skull insignia and fashioned it into a stunning set of bookends for use with books, video games, DVDs, or just as a stand alone decoration. 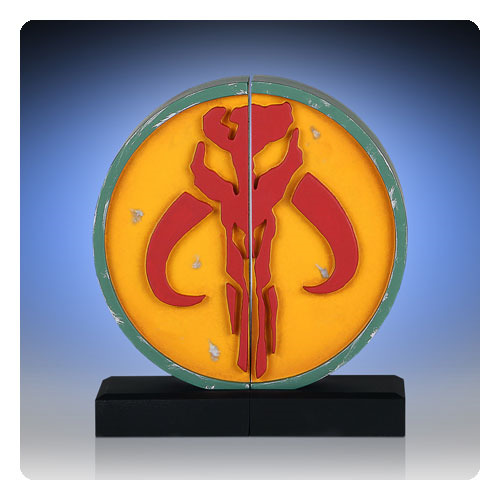 This Mandalorian Logo bookend will look great on your entertainment center, or in your library! Hand cast in resin and hand painted, this limited edition piece is both collectible and practical. May the Force be with you! (DVDs not included.) Ages 13 and up.